The “What Now” of tracking photogenic wheat . . .
Once again, Cousin Marvin and I loaded our camera gear into my Chevy Blazer and headed for Oregon’s share of the Columbia River Basin. Our first stop was The Dalles, where it is our tradition to have a sausage -egg McMuffin and a cup of coffee at the McDonald’s located where US 197 crosses the Columbia River. From this vantage point, barely downstream from The Dalles Dam, sometimes we can catch sight of a tugboat pushing huge barges loaded with wheat exiting the locks on their way down river. However, this day, this trip, we intended to track down wheat harvesters in the field. 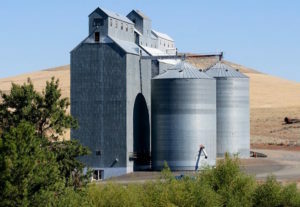 One key to identifying wheat country is the presence of grain silos. Posted like roadside sentinels, its where the farmers temporarily store their collected grain while waiting on the demands of the marketplace. We knew of monumental-sized wheat silos near Dufur and fortunately,we spied a couple of combine harvesting machines working adjacent to Dufur Mill Road. From a ringside seat to the action, we watched two combines devouring wheat, spewing clouds of chaff in their wake. Without slowing, they dumped accumulated grain into the trailer they towed behind their tractor. Their intricate maneuvers were like watching the Air Force Thunderbirds flying in precision formation. We photographed the action and wished for a video camera. So far our search for a photogenic wheat harvest was way too easy… we originally planned a two-day trip but because we immediately found what we were looking for, the pressure was off. Now what? The heart of Oregon’s blazing hot (109 degrees) wheat country was still in front of us. I topped off the fuel tank and we set out exploring. At a roadblock, we stopped to talk to a game warden about fishing in the Deschutes (he was also a wheat farmer and gave us directions to several wheat cutting operations near Wasco). Wheat operations along this route, however, were too far afield for decent photographs so we followed a tour route for observing wind turbines and ended up following OR 19 to Condon. Our dinner bell was ringing, but to our dismay Condon’s Café was closed. Now what? A local resident recommended the Roundup Grill. There we refueled, then headed toward Heppner to stay the night. A “no vacancy” sign greeted us at the town’s one and only motel. Now what? Pendleton motels were an additional 60 miles away. With darkness was fast approaching and with it the hazards of deer out grazing along the roadway, we chased the setting sun back to Condon to find the office lights off at the Condon Motel. Now what? While we pondered our next move the manager returned to the office. A few minutes later and she would have turned off the welcome sign and we would have been hunting for a room 70 miles away in The Dalles. After a night’s rest, we had breakfast at the Condon Café and made plans for a leisurely return trip to Portland closing the loop on our wheat country sojourn. In all, we toured 629 miles, took many photographs and got in no serious trouble. Now what? 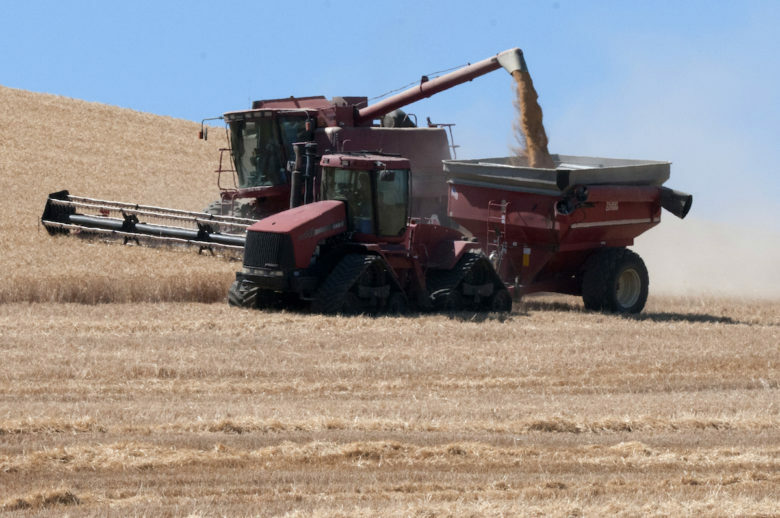 Oregon wheat producers raise primarily soft white wheat, which makes the best pastries, cakes, pretzels, cookies and the Asian noodles we know as ramen. Oregon’s wheat is enjoyed internationally in the form of pastries, flat breads (Middle East), and steam breads and noodles (Asia). The next time you are in the bread aisle or the bakery think of the thousands of wheat producers in Oregon (and throughout the US). How The Forest Practices Act Keeps Oregon Green. . .
Video clip of the storm and wheat field, you can really appreciate the wonderful light along with the gust front passing over towards the end, this looks alot better on the original HD footage I have.